The new system stores energy when sunlight is plentiful and then releases energy after sundown. Ontario Solar Provider and Diamond Head Industrial Mall Inc., are celebrating the opening ceremony of a 600 kW rooftop solar project in Cobourg, Ontario. 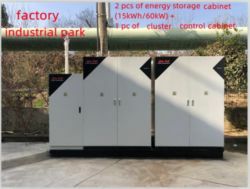 The inverter is available at power ratings ranging from 500kW to 3MW. The $2 million commercial rooftop installation, consisting of 1,488 panels, is expected to produce 7,900 megawatt hours of power over the next 20 years. As one of the first global module suppliers to manufacture this new generation of PV modules, ET Solar is again demonstrating the technology leadership for which the company is known. 09/16/15, 03:09 PM | Solar & Wind | UniRac Inc. The integration of Folsom Labs' HelioScope with Unirac racking products helps customers streamline their design and engineering process, from initial site assessment to detailed bill of materials and code compliance. 09/16/15, 03:08 PM | Solar & Wind | UniRac Inc. The research institute is leading the project to evaluate how net-zero energy homes that generate and store their own energy impact the local electricity grid.